I was happy to attend the White House ceremony on May 7 to sign the agreement between the U.S. and the European Organization for Nuclear Research (CERN) to renew the collaboration in particle physics and advanced computing. 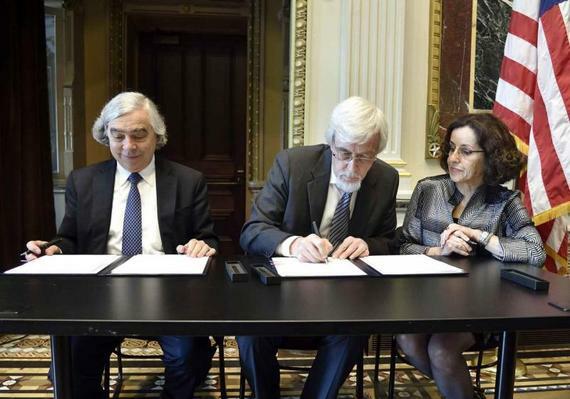 The agreement codifies the relationship between the National Science Foundation (NSF), the Department of Energy (DOE), and CERN to continue the strong U.S. participation in projects including the Large Hadron Collider (LHC). It also describes a path for reciprocity for CERN participation in U.S. hosted experiments. This agreement follows on the existing agreement signed in 1997 which paved the way for the U.S. participation in the CMS and ATLAS experiments. At the ceremony the Director General of CERN, Rolf-Dieter Heuer, spoke of the strong U.S. participation at CERN and that CERN could be thought of the largest U.S. research laboratory outside of the US with more than 1500 U.S. scientists hosted there. My research at the LHC with the CMS collaboration is funded by the NSF. I'm very grateful to have received the funding that allows us to find out more about how the universe works and to have worked with the CMS collaboration to discover what we think is the Higgs boson. The global thirst for knowledge and understanding means that internationally scientists look for opportunities to further their research. When the Superconducting Super Collider project was cancelled in the US in the 1990s, we hoped to find the Higgs at the Tevatron, which is located near Chicago. Many foreign scientists joined us in that pursuit. Alas, that wasn't meant to be, so we moved to the LHC where we were able to see it. About a third of the CMS collaboration is of U.S. funded scientists. Therefore I see the Higgs discovery as a triumph for the international science community as well as for the U.S. Someone asked would the Europeans have shut down CERN if the Higgs had been found at the Tevatron instead? I don't know. I realize that many consider that the Higgs discovery is a European triumph since the detectors and accelerator are located at CERN. It is, but I also think of it as a U.S. triumph. I read with interest the Innovation Deficit report put out by MIT. I agree that the U.S. needs to continue to invest in scientific research at a high level. It helps drive our economy and so many other important things in addition to helping us learn how the universe works. I also think that the U.S. should lead in technology. I was a bit dismayed that the Future Postponed paper said that the discovery of a new fundamental particle wasn't a US-led achievement. The CMS announcement of the discovery of the Higgs was given by Joe Incandela from Univ. of California, Santa Barbara who was the leader of the collaboration (a U.S. leader). While I realize that hosting the accelerator is important for national pride, I hope that we can get to a world where we have pride in the international science endeavor and we celebrate achievements and fund basic science research whether it happens within the US boundaries or not. We shouldn't think of science like sports games where there are winners and losers, we are all winners when we advance human knowledge. The CERN/U.S. agreement is a step that allows U.S. scientists to participate in this truly international endeavor.